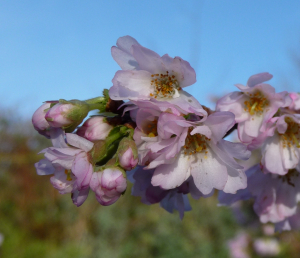 Observation - Cherry Tree - Early flowers - UK and Ireland. Description: This cherry tree has been flowering since about mid November which seems very early to me! It was newly planted this summer. There was also a bumblebee on it this morning in 4 degree weather! This cherry tree has been flowering since about mid November which seems very early to me! It was newly planted this summer. There was also a bumblebee on it this morning in 4 degree weather!